Los Cristianos is located on the southern Tenerife coast, Canary Islands, Spain. The south of the island of Tenerife is both warmer and dryer than the North. 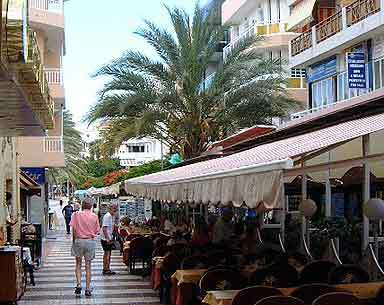 Los Cristianos is a quieter and more relaxed resort than certain areas in Playa de las Americas it's next door neighbour, but you will still find plenty of entertainment in its many bars, pubs and restaurants. Although popular with all age groups older couples and groups and people with younger families will find Los Cristianos appealing. Los Cristianos is one of the most popular resorts on the Island. Originally a small fishing village in the south west corner of Tenerife. It is only 10 miles from the main Airport of the South Reina Sofia. Well served by the main motorway and local roads it is ideally situated for access to all of the Island. Even with all its added tourist attractions Los Cristianos still manages to retain some of the old world charm, with the church square and terraced shopping streets. The harbour at Los Cristianos is used by the ferry company Fred Olsen for the short hop to La Gomera. The harbour is not only a ferry terminal it also acts as departure point for local cruises (dolphin and whales) and the infamous booze cruise. Locally there are several scuba diving departure points. There are still a few fishing boats both commercial and day trips. The harbour is now also a marina with quite an array of impressive boats and yachts. The beaches of Los Cristianos are manmade with imported sand, though world renown as a place to immerse yourself and help to relieve muscular and joint illness there is a clinic locally dedicated to this therapy. Los Cristianos to Reina Sofia Airport around 15 - 18 euros. Los Cristianos to Playa de las Americas around 5 - 6 euros. The bus service on Tenerife is run by TITSA. The coaches are comfier than United Kingdom public transport and are very cheap, especially if you buy a prepaid Bono bus ticket. Which knocks off 30% from the fare for short journeys and 50% for long journeys. Buy the tickets from bus stations. Buses are extremely frequent between Los Cristianos and Playa de las Americas. The main bus stops are located near to the San Marino apartments to rent complex. The bus stops for travelling in both directions are located on the same side of the dual carriageway, and because the route number is the same check that you are at the correct stop. The stops for buses going to or through Playa de las Americas are on the lower end of the road, and travelling away from Playa de las Americas such as the airport and Costa del Silencio at the higher end of the road. There is another stop on the dual carrigway that runs parallel to the coast, just inland from Montana Chayofita and another on the Playa de las Americas side of Montana Chayofita amost on the boundary between the 2 towns. There is a stop near the ferry terminal but very few buses per day go to this stop.